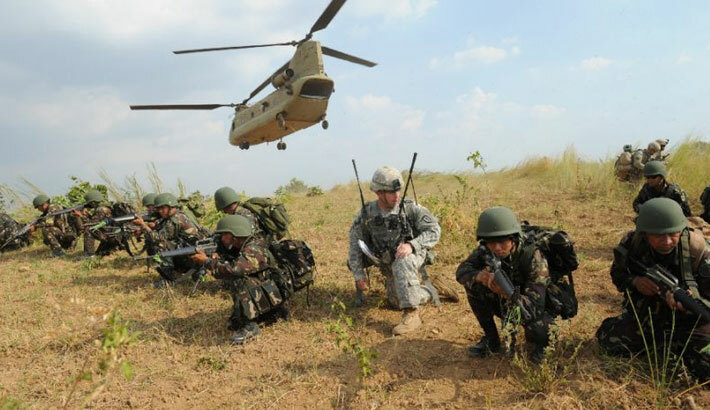 MANILA: Thousands of US and Filipino soldiers will on Monday launch annual war games that this year are being seen as a show of strength in the face of China’s increasing assertiveness in the region, reports AFP. The 11-day Balikatan (shoulder-to-shoulder) exercises are expected to show how the Philippines, though severely outgunned, can counter China with the help of the United States, its longest-standing ally. China has in recent months built massive structures including radar systems and an airstrip over reefs and outcrops in the contested South China Sea, sparking international concern. Beijing lays claim to almost all of the waters, which are important for international shipping and believed to hold valuable mineral and energy deposits, and neighbouring countries fear China could impose military controls over the entire sea. The joint manoeuvres come ahead of a decision this year by a United Nations-backed tribunal on a legal challenge by Manila to China’s territorial claims. Adding to the tensions, the Philippines is preparing to host US troops in five bases under a defence pact born out of US President Barack Obama’s plan to reassert American influence in the Pacific. Balikatan has evolved from counter-terrorism manoeuvres against Islamic extremists like the Philippines’ Abu Sayyaf, to simulations of retaking and protecting territory as disputes with Beijing have escalated. However, Filipino and US officials insist the exercises are not explicitly aimed at China. Balikatan spokesman Captain Celeste Frank Sayson said 55 US aircraft would take part in the drills, while the Philippines will deploy fighter jets it has recently acquired. While no specific staging areas have been disclosed, the two allies have in recent years held war games at air bases just 230 kilometres (140 miles) from the disputed areas in the South China Sea. Rene de Castro, an international studies professor at the De La Salle University in Manila, told AFP the drills appeared to have China’s expansion in the South China Sea in mind. “Looking at the features of Balikatan—the mobile missile-launchers, the fighter planes—that is an indication that the alliance is being geared for territorial defence,” he said. Richard Javad Heydarian, a political science professor at the De La Salle University in Manila, added that the exercises “aim to enhance interoperability among allies nations and signal their preparedness to confront China if necessary”. The Philippine military said the US High Mobility Artillery Rocket System (HIMARS), designed to shoot down aircraft, will be sent to Palawan, the Philippines’ westernmost island on the South China Sea, during the war games.